Solving the puzzle requires a few good guesses and a willingness to test out ideas, so it’s easy to get stuck. But I think this is a fun puzzle to solve and do not want to spoil it by giving away the complete solution immediately. Instead, this post gives a few hints to spark your own ideas before explaining the main method of solving the puzzle. There is then a detailed solution to the Drawer 1 puzzle, and finally a summary of the solutions for the next 4 Drawers. I’ll published solutions for the final 5 Drawers next week. “The gods stand upright and give latitude. From the yarns pluck golden songs to string across. With this grid you may now navigate The Egyptian Jukebox. First ask yourself what Gods are being referred to. The answer is right in front of you! There are 10 of them, one for each drawer in the book. Next, what are the yarns? This line is deliberately misleading by suggesting you have to “pluck” something from the yarns and “string” it across. This hints at the meaning of yarn as a type of string or thread. Ignore this meaning and think again. The third line of the inscription tells you that these two pieces create a grid. This is quite literal. Upright, vertical Gods, and golden songs (whatever they are) strung across horizontally create a grid pattern. Consider which bits of the book it would be useful to place a grid over. Finally there is the direct statement that each drawer contains a small part of the solution toward the final answer. This simply means that each drawer is its own separate puzzle. Solve them all and you get ten pieces which fit together to make up the final solution. The other key step is to interpret the Clue Page for each drawer. Looking in detail at Clue Page 1 will help with all the other pages as the basic method is the same for each. Click the image for a full size version. First we have a picture of a Egyptian-looking animal. In fact, it looks like an Egyptian God. We know from line one of the cryptic Inscription message that Gods have to stand upright… somewhere. Next is a code, “Ln 7 Wd11 / Ln26 Wd4”, followed by the date 24 May ’69. We’ll come back to this in a moment. Third is a set of instructions, telling you to travel in different directions. 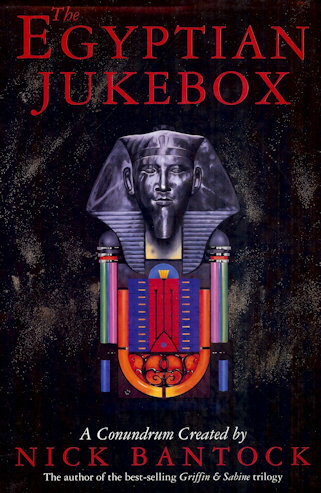 The third line of the cryptic Inscription says that a grid would help you to “navigate” The Egyptian Jukebox, and here we have navigation instructions. These instructions refer to scarab and there are several scarabs contained with the drawer. Finally is a statement, “You are now in possession of the fifth”. The fourth line of the cryptic inscription tells us that each Drawer gives part of the solution. Whatever is in Drawer 1 is the fifth part of that solution. This leaves the code and the date. The only bit of the Inscription that hasn’t been referenced is the second line, referring to yarns. So, this code has something to do with plucking a golden song from a yarn. This song needs to be strung across somewhere. OK, that’s it. That’s it for the clues. From here on this post is just direct answers. Stop reading now if you don’t want spoilers! 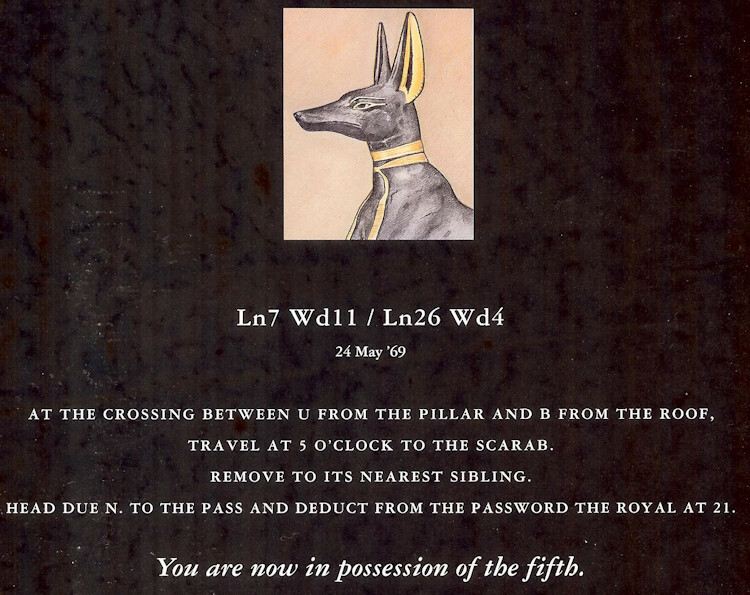 The God pictured on Clue Page 1 is Anubis, the Jackal. This God must stand upright in Drawer 1 to create part of a grid. The drawer already has points of the grid marked on it: the black marks along the left and top edges of the drawer. 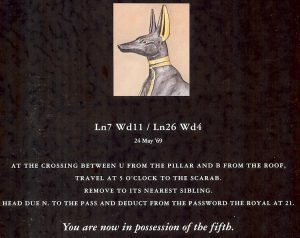 There are six black marks along the left edge, one for each letter of “ANUBIS”. The solution is that the God’s name must be placed upright along the left edge, each letter aligned with a black mark. I think this is ambiguous: “upright” could mean either that the name reads from top to bottom or from bottom to top. Through trial and error (particularly in Drawer 2) it becomes clear that top to bottom is the correct order. The code picks out specific lines (Ln) and words (Wd) in the story (yarn) for Drawer 1. Line 7, word 11 is “GET”, and line 26, word 4 is “BACK”. Seven letters in total, equal to the number of black marks along the top of Drawer 1. These letters are “strung across” from left to right, each placed in a different black mark. “Get Back” was a number 1 hit for the Beatles, a “golden song”. It reached the top spot in the US on 24 May 1969. The letters of the God’s name down the left side and the song title along the top provides a grid over the drawer to help follow the navigation instructions. Going throught the navigation instructions on the Clue page takes us on a Magical Mystery Tour around the drawer. The first instruction is: “At the crossing between U from the pillar and B from the roof”. This tells us to draw a horizontal line from the U of “ANUBIS” and a vertical line from the B of “GETBACK” and to find their crossing point. “Travel at 5 o’clock to the scarab” means to move from that crossing point in the 5 o’clock direction (down and right) until you find a scarab. This is the scarab nearest the bottom right corner of the drawer. “Remove to its nearest sibling” means to find the next nearest scarab. This is the one at the bottom middle of the page. “Head due N. to the pass” means to move from that second scarab straight up the page. The first “pass” that you find in that direction is a Museum “entrance ticket” (item number 11 in the map on the Clue page). Next we’re told to “Deduct from the password the Royal at 21”. The “password” is the word written on the pass, which is “Museum”. Item 21 is the Seal of King Sum-Mu, so the Royal at 21 is “Sum-Mu”. Removing the letters of King’s name from the word “Museum” leaves a single letter: E.
The solution to Drawer one is the letter “E”, and this is the fifth letter of the final answer. 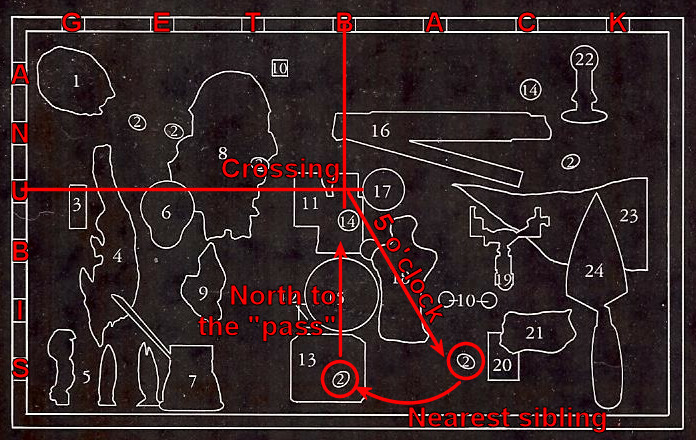 Below is a full map tracing out the path travelled around Drawer 1. In Drawer 2 the God is “HATHOR”, the cow. This may not be immediately obvious, but can be worked out by a process of elimination from looking at the other pages. The golden song is “SOUNDS OF SILENCE”, which was a US no. 1 hit for Simon and Garfunkel on 1 January 1966. The letters “HATHOR” are placed in the 6 black marks down the left side of the Drawer. The letters “SOUNDSOFSILENCE” are placed in the black marks across the top of the Drawer. Following the navigation instructions on the Clue page, the “bookseller’s coin” is the coin on the “Bookseller card”, item 18, near the middle of the Drawer. The “subway circle” is the O of “metro”. Drawing a line from the coin through the O reaches the fleur-de-lis “Town Shield”, item 1, near the bottom right of the page. Moving up from the shield, the obstruction is the lump of “False Alchemist’s Clay”, item 22. Heading left from there takes you past the “small weapon”, a 4 of clubs. Carrying on in this direction you intersect a diagonal line drawn between the H of “HATHOR” and the first E of “SOUNDSOFSILENCE”. The intersection point is the letter H of the Greek “Fatality” inscription, item 11. The eigth letter of the answer is “H”. In Drawer 3 the God is “THOTH”, the baboon. The song is “GET OFF MY CLOUD”, which was a US no. 1 hit for The Rolling Stones on 7 November 1965. In full, the song title was “Get off OF my cloud. The “hole in the middle of the song’s watery vapour” is the O in “CLOUD”. Down from there, near the bottom right of the page, is one of the metal spheres. The most distant similar sphere is near the top left corner of the page, to the left of “Lady Moonspider”, item 2. Up from the sphere is a “Silverfish”, item 1, i.e. a “coldblooded vertebrate”. Left from the fish is the black mark of the letter T in “THOTH”. Dropping two letters takes you to the letter O. “Thinking back to that which comes immediately before” means the letter before O in the alphabet, “N”. The second letter of the answer is “N”. In Drawer 4 the God is “SEKHMET”, the lion. The song is “SUPERSTITION”, which was a US no. 1 hit for Stevie Wonder on 27 January 1973. The “Eye protector” is the “Flying goggles”, item 4. The “Ritual rotator” is the “Ceremonial spinning top”, item 7. The “Female Borgia” is “Lucrecia”, item 21, daughter of Pope Alexander VI. 4 plus 7 equals 11. 21 minus 11 equals 10. Item 10 is the feather near the bottom left of the page. The grid letter to the left of the feather is the letter T of “SEKMHET”. The grid letter above the feather is the letter E of “SUPERSTITION”. The Sun God is “RA”. The object between items 11 and 19 is the Sea Tree, item 17. Taking away the letter T, three letter Es and the letters R and A from “SEA TREE” leaves only the letter S.
The tenth letter of the answer is “S”. In Drawer 5 the God is “BAST”, the cat. The song is “LIGHT MY FIRE”, which was a US no. 1 hit for The Doors on 29 July 1967 (according to Wikipedia). The “First peeler” is the first policeman on the “Police signal card”, item 1, after Robert Peel, founder of London Metropolitan Police. The “Char receptacle” is “R Lee’s mug”, item 4, since a mug of tea is also known as a “cup of char”. The “leather cherry” between them is the “Cricket ball”, item 3. Moving north east from the ball there is an old one-penny coin, featuring Britannia, the “Trident holder”. She is indeed at the grid intersection of the B from “BAST” and the H from “LIGHTMYFIRE”. Between the ball and the coin are several bingo numbers on the “Lotto sheet”, item 5. The second number reached is 50 and the Roman equivalent for that number is “L”. “The traveler” is item 24 in the bottom right corner, and there is an inverted number 39 next to him. The letter beneath that number is “N”. The letter betwen L and N is “M”. The fourth letter of the answer is “M”. Half-way through the book already! Try the rest for yourself or continue to part 2 of the solution.